The Ibanez RG is a series of electric guitars produced by Hoshino Gakki and one of the best-selling superstrat-style hard rock/heavy metal guitars ever made. The first in the series, RG550 was originally released in 1987 and advertised as part of the Roadstar series. That series was renamed 'RG' in 1992 and all models since are simply known as RGs. It rose in popularity throughout the 80s and it had the features that musicians in the rising shred and thrash metal movements of that time were looking for - a fast neck, comfortable body, powerful pickups, and a reliable tremolo system. The RG series has the most subtypes of any Ibanez model  and is the most popular series of Ibanez electric guitars produced by Hoshino Gakki. The RG's deep cutaway, flatter fingerboard and extended fret range (24 frets as standard) has made it one of the most popular guitars for rock and metal music. The Ibanez RG was originally designed in 1987, the same year as Steve Vai's signature guitar JEM 777, and perhaps RG was received and served as a derivative of Vai's model back then. Also, there has been some confusion and mischief around the RG name. One of the popular opinion was that Rocky George (guitarist formerly of Suicidal Tendencies, currently of Fishbone), was its designer, because Rocky's initials are the same as the model, and he was one of the first famous users of the RG model. Another was that it was meant to be a competitor for Yamaha RGX. Both above are disputed. 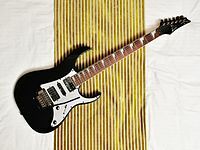 The RG in the Ibanez RG name, in reality, is now widely considered to mean "Roadstar Guitar", although current instruments differ significantly from the past Roadstar and Roadstar II series, introduced in from 1979 to 1986. The RG Series features a neck that is very thin in cross-section a wide, flatter than most (430mm/16.9in or 400mm/15.75in radius) double octave (24 fret) fretboard. Flatter radius on fretboards facilitate wider bends and lower string action at the expense of comfort in playing chords. For the virtuosic "shred" style of guitar playing or fast, aggressive thrash/speed metal rhythm, this type of neck is often preferred. The fretboards are usually made of maple or rosewood. The body of the RG Series features sleek, offset pointed double cutaways giving better access to the upper frets. Typically the body is made of Basswood or Mahogany, with some exception such as swamp ash (RGT220A) or alder (select J Custom RGs). The pickups are usually configured as HSH, HSS or HH. There are Japan-Custom IBZ, USA-Custom IBZ, Infinity, Powersound, Seymour Duncan, DiMarzio, Acis, LoZ or EMG pickups in the RG Tremolo and Fixed series. The Prestige series typically comes equipped with either the USA and Japan IBZ series, IBZ DiMarzio pickups, DiMarzio pickups in different configurations (most often the "Tone Zone" and "Air Norton"), active EMGs in several configurations, and one model comes equipped with Non-OEM Seymour Duncans. Bare Knuckle pickups are now standard on some Prestige models. All of the RG550s, 560s, 565s, 570s, 670s 750s, 760s and 770s have a version of the Ibanez Edge tremolo (vibrato unit), be it Original or Lo-Pro. The Edge tremolo incorporated several manufacturing changes when compared to the original Floyd Rose, including increased mass, relocated fine tuners and improved locking posts. The locking posts are no longer used as of the 2003 model year along with the introduction of the Edge Pro. While most models of the RG series use variations of Ibanez Edge tremolo, there are fixed bridge models available, which are equipped with either a Hipshot-style bridge or a Gibraltar standard bridge. Fixed bridge versions of the Edge bridge are also available on a few select signature models. Since the release of RG7620 and 7621 in 1998, RG's are famous for being the basis of particularly easy to play seven string guitars. Also, in 2007, Ibanez produced its first commercially available 8 string guitar, the RG2228. Ibanez introduced their first commercial nine-string models, the RG9QM and RG90BKP, for 2014. Arched top body shape. Introduced in 2005. Longer 26½" scale length, optimized for down-tuning. Introduced in 2010. RG guitars with traditional synchronized tremolos. Introduced in 2016. More "traditional" features and look, such as non-locking synchronized style bridge. Available only in 1992–1993. Same concept as RT, except these are 22 fret guitars. Introduced in 1994. Highest quality RG guitars produced in Japan by FujiGen or Sugi Guitars. Introduced in 1996. Most J Customs are offered exclusively in the Japanese domestic market, but a handful have been made available in other markets around the world. High quality RG guitars which are made in Japan by FujiGen. The Prestige series was instituted in 1996. All Japanese-made RG models since 2003 are included in the Prestige line including those in the RGA and RGD series. Prior to 2003 many Japanese-made RGs were not designated as Prestige. Mid-tier guitars produced in a special facility set up in Indonesia. The Premium line started in 2010 and sits above the "standard" RGs and below the Prestige series. Some recent (as of 2017[update]) Premium models have upscale features not offered in the Prestige line such as stainless steel frets and necks laminated from eleven pieces of wood. Indonesian-made RG guitars that are primarily aimed at the metal guitarist. The Iron Label line started in 2013. Entry-level guitars which are produced primarily in China. This page was last edited on 21 March 2019, at 13:22 (UTC).